Combining a psychiatric comedy with a Hollywood insider story, Shrink gives us the character of Henry Carter (Kevin Spacey). Henry may be a successful psychiatrist to the stars, but he needs some mental help himself. His first pro bono case, a teenage girl from a less-than-affluent neighborhood, causes him to realize the peril of his current mental state. This comedy also stars Saffron Burrows as an actress who has fallen from grace, Mark Webber as a writer who is unsure of himself and his talent, and Dallas Roberts as a neurotic but powerful agent. $16.443 thousand on 2 screens. Hollywood likes to poke fun at itself, and that seems to become part of 2009�s Shrink. Henry Carter (Kevin Spacey) serves as a psychiatrist to the stars. He preaches �happiness now� but clearly doesn�t feel too cheerful himself. His wife killed herself in the not-too-distant past, so Henry smokes pot to �self-medicate� and resists the urges of his friends and family to go into rehab. Feeling burned out, Henry picks up a pro bono case. He chats with troubled high school student Jemma (Keke Palmer), a film freak who suffers through her own feelings of grief after the loss of her mother. The film follows their relationship and also visits the goings-on of a few of Henry�s clients. Based on the press info I got, I expected Shrink to be a comedy in the Entourage vein. With a tag line like �in Hollywood, even the shrinks are crazy!�, I can see why I figured it�d be a light-hearted spoof of show biz clich�s. To say the least, Shrink falls far from the expected territory. In truth, it provides a pretty dark, depressing ensemble piece. It occasionally tosses out minor bits of humor, but those elements popped up infrequently. That means Shrink lives or dies with its character drama. Unfortunately, most of the time it slumps. Part of the problem comes from the film�s focus. While Carter acts as the element who ties together the other characters, he�s only marginally the movie�s main role. It�s really much more of an ensemble piece, as it drifts from one participant to another. I think someone may have seen Crash a few too many times. While Shrink doesn�t attempt the same sort of social introspection as that Oscar-winner, it does go for the same kind of scope. With all these unfulfilled roles, Shrink really meanders. I don�t mind the fact that it�s glum and depressing, but the superficial nature of the characters makes it a tough slog. Perhaps if their situations had a little more pep to them, the film would work. However, the storylines tend to drag as well. �Dull and mopey� don�t automatically make a movie meaningful. 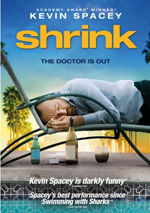 Shrink proves that, as it offers a film that can�t ever overcome its bland moroseness. The premise boasts promise, and it comes with a good cast, but the flick�s obsessive darkness makes it tough to take, even when it wraps up with the requisite � though illogical � happy ending. Shrink appears in an aspect ratio of approximately 1.78:1 on this single-sided, double-layered DVD; the image has been enhanced for 16X9 televisions. This was a consistently ordinary transfer. Sharpness was generally decent, but rarely seemed very good. The movie tended to display acceptable definition but not better than that. Though the occasional shot looked really tight, most were simply fair. No issues with jagged edges or shimmering appeared, and edge enhancement was absent. Source flaws weren�t an issue, though some artifacting and blockiness could occur. Like the sharpness, colors appeared mediocre. The film went with a fairly amber tint that seemed acceptable but somewhat flat. Blacks were bland and somewhat flat, and shadows tended to be dense. While the flick boasted enough appealing images to get a �C+�, it was usually a pretty lackluster presentation. Similar thoughts greeted the perfectly average Dolby Digital 5.1 soundtrack of Shrink. However, I couldn�t find much to criticize here, as the film�s focus meant that it didn�t need an active multichannel mix. Music showed good stereo imaging, and mild ambience also cropped up along the way. These used the different speakers in a minor manner but didn�t do much to expand the soundfield in an engaging way. Audio quality seemed fine. Speech occasionally seemed a bit stiff, but the lines were always intelligible and usually appeared reasonably natural. Effects were a minor factor but they sounded fairly accurate. Music worked best, as the score was acceptably lively and warm. Nothing special occurred here, so this was a �C� soundtrack. The DVD comes with a mix of extras. We open with an audio commentary from director Jonas Pate and producer Braxton Pope. Both sit together for this running, screen-specific look at themes, story and characters, cast and performances, sets and locations, challenges related to the low-budget, independent production, music and cinematography, and a few other areas. Overall, the commentary provides a good look at the production. Pate and Pope keep things moving well, and they infuse the chat with a fair amount of humor. They temper their irreverence with useful notes that allow this to become a solid commentary. We hear more from that pair in some Interviews with Director Jonas Pate and Producer Braxton Pope. This program runs 22 minutes, 20 seconds, and includes notes about the script�s evolution and path to the screen, themes, story and other development issues, and cast and crew. Both men were taped separately. Pope starts, and his segment fills the program�s first 12 minutes, 10 seconds. We find a smattering of good notes here, but there�s a fair amount of repetition from the commentary. Still, it�s a decent piece. Six Deleted Scenes run a total of seven minutes, 16 seconds. Most are minor character bits, though they do allow Shamus greater screen time and development. A couple of them accentuate the Hollywood side of the story; though unnecessary, they�re actually interesting. The other tidbits lack much purpose, as they tell us little that we don�t already know. We also find a Music Video for �Here� from Jackson Browne. To call this a �music video� is an overstatement, as it just combines movie clips and shots of Browne in the studio. Both the song and the video are eminently forgettable. The DVD opens with a few ads. We get clips for Goodbye Solo, The Stoning of Soraya M, The September Issue, Swimming with Sharks, Good Hair and Mad Men. These show up under �Also From Lionsgate� as well, and we get the film�s trailer too. Despite an intriguing concept, Shrink provides a relentlessly dull experience. The movie comes with a good cast but lacks interesting characters and suffers from its attempt to fit in so many different personalities; with all these folks in tow, we never connect with any of them. The DVD offers average picture and audio along with a smattering of good extras. The movie fails to fulfill its potential and turns into a turgid, meandering mess.